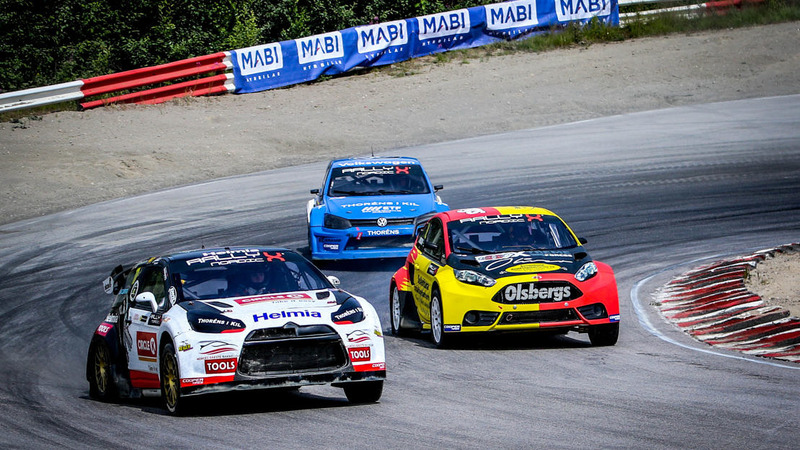 RallyX Nordic presented by Cooper Tires returns from the summer break this weekend (11-12 August) with its annual visit to Denmark and the Nysumbanen rallycross track, which kicks off the second-half of the 2018 season. Heralding the fourth round of this year’s championship, Nysum has become a firm favourite amongst fans and drivers on the RallyX Nordic schedule. Typified by its fast-flowing layout spread over a length of 1160m, Nysum is notably the series’ only venue to feature a ‘figure of eight’ configuration with its bridge doubling up as the spectacular jump. Oliver Solberg arrives in Denmark as the RallyX Nordic series leader following his second win of the season in Grenland, a result that lifted him ahead of Thomas Bryntesson into the lead of the championship for the first time in his career. Having stayed ‘match fit’ during the summer break with a number of motor sport outings across Scandinavia, Solberg will now attempt to build on his dominant performance in Norway after achieving the first perfect scorecard of his career. As ever though, he faces stiff opposition from Bryntesson, who himself enjoyed a confidence-boosting run to the podium in the FIA European Rallycross Championship at Holjes during the break. Assuming the role of title chaser for the first time this weekend – four points behind Solberg – Bryntesson will be keen to call upon the form that took him to a dominant win at Nysum with JC Raceteknik in 2017. Similarly, Peter Hedstrom has set his sights on the top of the rostrum having shown front-running pace in the opening half of the season. However, after failing to finish any of the three finals he has started this year, Hedstrom remains a significant threat with the benefit of a clean weekend. Furthermore, this weekend will see the competition level raised with the return of Arvika podium winner Philip Gehrman, who re-joins the ranks in his Eklund Motorsport Volkswagen Beetle, while the homegrown Danish ranks are swelled by the addition of Ulrik Linnemann in his Volkjswagen Polo and Dennis Romer in a Peugeot 208. A familiar front-runner on the European Rallycross stage, Linnemann is currently riding high in fifth overall on the continent, while this weekend’s event sees him reunited on the track with a number of drivers that dovetail RallyX Nordic with Euro RX. Though this will be his RallyX Nordic debut, Linnemann will attempt to use the benefit of local knowledge at Nysum to upset the regulars whilst delighting the home supporters. Elsewhere, this weekend’s RallyX Nordic event in Nysum will see the inaugural outing for the new Super Touring RXN category. Based on the TouringCar class that competes on the Euro RX stage, Super Touring RXN makes its debut as part of a broader view to it becoming a permanent fixture on the 2019 schedule. Guillaume De Ridder remains the man to beat in the Supercar Lites category after notching up a third consecutive victory last time out in Grenland. The Olsbergs MSE driver, who is embroiled in a thrilling title battle with RallyX Nordic Supercar driver Oliver Eriksson in the RX2 International Series, will look to further his advantage in Nysum against another ultra-competitive field. Ben-Philip Gundersen heads up the challenge in second overall, ahead of defending champion William Nilsson and Sondre Evjen. New to RallyX Nordic in Nysum is the inclusion of the Super Touring RXN class. Based on the TouringCar category that supports the FIA European Rallycross Championship, Super Touring RXN joins the schedule in a special outing this weekend with a long-term view to the class becoming a regular feature on the RallyX Nordic calendar from 2019 onwards. Heading up the eye-catching entry list is newly-crowned European champion Sivert Svardal, plus notable front-runners Jan Emil Wilsberg, Daniel Lundh and Tobias Daabak.